If this is the first time you’ve visited my blog, welcome! It’s great to see you here. My name is Melinda J. Irvine and I’m an Australian freelance writer, poet, and blogger. Even though I’m Australian, I spend most of the year in the Philippines. I first came to the Philippines in early 2014 to volunteer after SuperTyphoon Yolanda smashed the coastline of the Western Visayas. After only a few weeks I felt a strong connection with the local children, and was inspired by their open friendly nature and stoic attitude toward extreme poverty and frequent natural disasters. But it was an orphaned boy (only 7 years old) who captured my heart, and inspired me to sell everything I owned then start a freelance writing business so I could stay in the Philippines and take care of him. So for the last 5 years I’ve devoted myself to caring for Jerry as well as supporting another 20+ kids who live in his home village. Here on the blog you can read all about my life as adopted mum to Jerry while helping the kids he’s grown up with go to school. I fund and manage all of these projects myself (books, stationery, lunches, uniforms, and clothes etc) and they are my way of encouraging the children to go to school. My goal is to one day operate a dedicated creative learning centre for the kids as well as become Jerry’s legal mum. 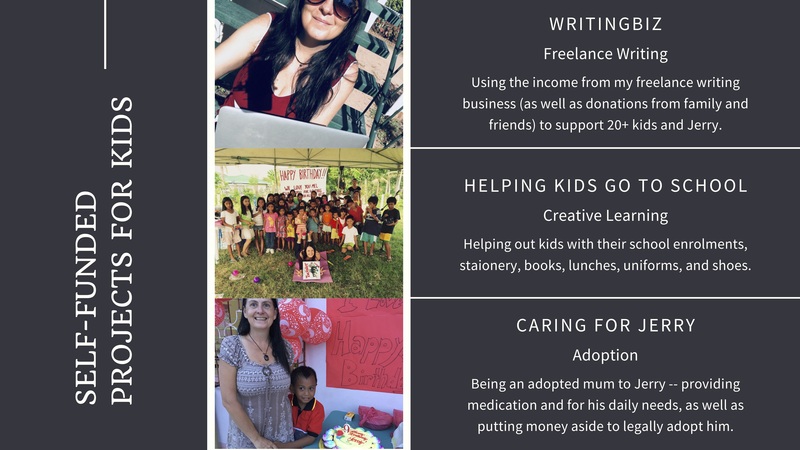 While my projects are funded by my freelance writing business (and the support of family and friends), your donations are always welcome too. Please get in touch if you would like to learn more. How to keep kids safe from harm? What are those ladies laughing at? Could you give up your woolies animal cards? Please don’t get the chairs from this ‘room’! Her business was spared from the market fire … but what is the cost?